Sometimes nature is just begging to be turned into a Disney movie. This is an example of one of those times. You see, here we have a tale of a friendship so adorable that it has to be seen to be believed. These two precious souls were brought together and documented by a German professional animal photographer. And we should all thank her for this cuteness. The owl loves the dog so he goes where the dog goes! 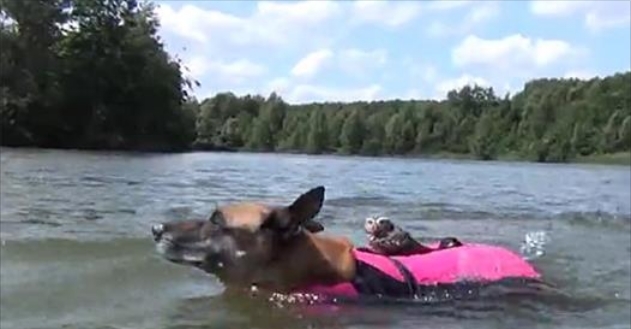 Watch him hitch a ride as they enjoy a nice swim in the water. This is definitely one of the most unique friendships we've ever seen! Once an owl swims to shore, it will typically fluff out its feathers to dry. "They'll shake it off," "They'll preen a bit. They'll rouse. They'll go up into a tree and let their feathers dry." Responses to "Ridiculously tiny owl uses it's very own water taxi"